On September 22, The Chiropractic Society of Rhode Island (CSRI) will celebrate its 100th anniversary. 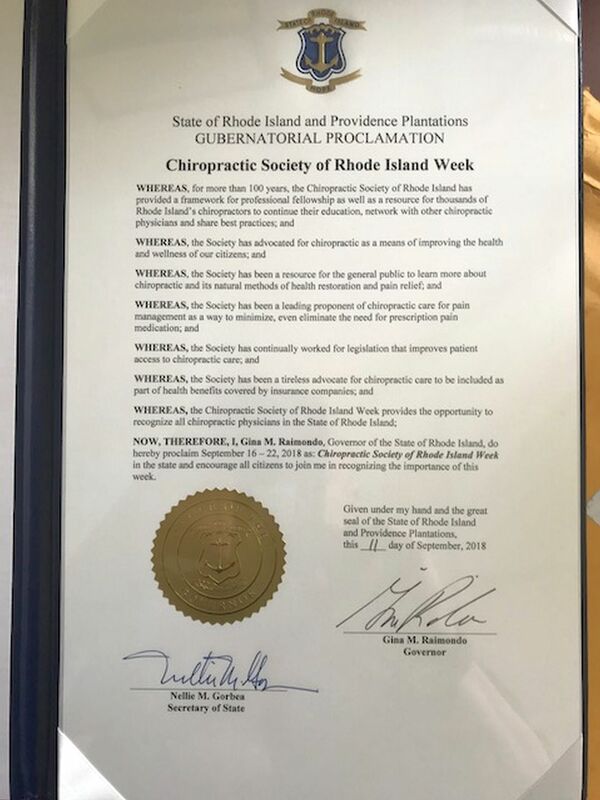 That celebration got off to an early start with both Governor Gina M. Raimondo and the Rhode Island General Assembly issuing proclamations declaring September 16-22 to be the Chiropractic Society of Rhode Island Week. The Chiropractic Society of Rhode Island is one of the oldest societies of its kind in the United States. Over the years, the Society has worked diligently to provide continuing education and networking opportunities for its members as well as educating the public on the many benefits of chiropractic and its drug-free approach to pain prevention and pain management. Nearly half the state’s chiropractors are members of the Society. Celebration of 100th anniversary will take place at a gala celebration on September 22 at the Rotunda Ballroom at Easton’s Beach in Newport. The night will include special guest speaker Dr. Dean Depice, a chiropractor and nationally renowned speaker and chiropractic practice coach and consultant. In addition to ceremonies, speaker, cocktail hour and dinner, entertainment will be provided by The Teledynes. Sponsorship opportunities for the event are still available. The three levels of sponsorship include: Platinum, $1,000; Silver, $750; and Bronze, $500. Benefits of sponsorship are pre- and same-day mention in all promotions. Companies interested in sponsoring the celebration can contact Shael Colantonio at CSRI headquarters at (401) 207-0700 or [email protected].